Since attempting to photograph my "Diamonds in the Pond" quilt from several different locations (see last post), I decided that the best spot is still on my sewing room design wall. However, the tray ceiling and adjacent wall (on the right where my rulers are hanging), make shadows on whatever is on the design wall. 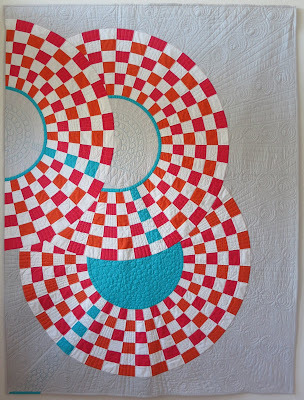 A blog reader/friend, pointed me to this "Shoot That Quilt!" article, that provides lots of great information about setting up to take pictures, and even settings for one's camera. Though the article appears to have been posted a while back, the information remains relevant, and the links to various products still work. Only the prices of those products (light bulbs and reflector lamps) have increased slightly, as I found out after making purchases. The article explains that daylight bulbs aren't all the same. So I ordered four of these from 1000bulbs.com, (linked in the article), for $5.18 each. I'll need only two of the bulbs for the two portable work lights I bought at Lowe's Home Improvement, but having two back-up bulbs makes sense. These lamps are $7.68 each. The article explains how to build stands for each lamp, so the lights are at the same level as the camera. Happily, I have a quilt stand with two sturdy pole legs that I can clamp the lamp onto, and then position the height to whatever I need. This was my set-up. Note that the following two photos were taken with my iPhone 8. While my phone takes vivid, clear pictures, I'm never pleased with the intensity of the colors, which I think are exaggerated. For example, the navy at the bottom left of this quilt is not that dark. Photographing "Owl Always Love You"
I mounted my Canon camera on an adjustable table-top style tripod, sat the tripod on a step stool, and sat the stool on one of my IKEA adjustable-height sawhorses, with the sawhorse at the highest height. Certainly, if I had a floor stand tripod, I would use it. But this worked. Here is "Roulette," my wedges quilt photographed without daylight bulb lighting. 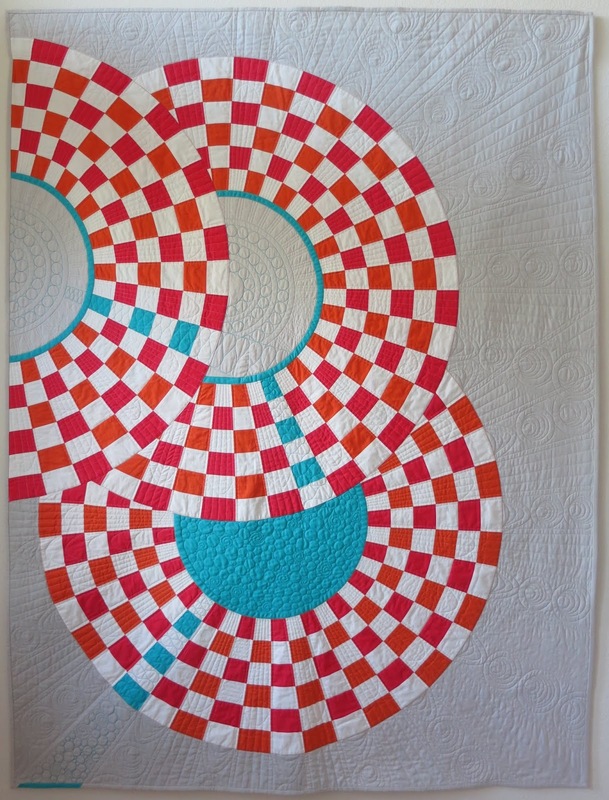 Though shadows appear on the quilt, the quilting texture is apparent. Here's the photo with daylight bulb lighting. 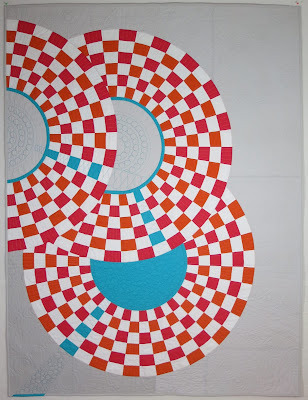 While the quilt appears brighter overall, I've lost the visual texture of the quilting. I read that article also. Bought the lights, backdrop, and new light stands. Money wasted! I find the best photos are outside when the sun is directly overhead. You can see the colors the quilting. Finding a day when the weather is cooperative is the hardest thing. Good luck finding the perfect shot! Quilt photography is interesting, we all experiment with the best place in the house for the equipment at hand. My greatest angst is the way my camera sometimes won't "read" a certain color at all, no matter the lighting or setting, flash or no flash. On my monitor, to my eyes, the more interesting photo of Roulette is the one with the shadows because they add dimensionality to the piece. But I understand the need to have full-on professional looking shots of quilts that will be entered into competition etc. I hope your efforts will soon be rewarded with photos that you love, because that's what is most important! Interesting! Too bad this wasn't the perfect 'fix' for you but hoping more experimenting will. Light really is complicated! Place your lights more to the side of your quilt, not facing the quilt. That should help. Follow Flourishing Palms's board Some of My Quilty-Made Things on Pinterest. Make an Edith Bag - Sew up this cute zipper bag. How to Sew a Web - A time-saving way to chain-piece a quilt top. No Tails Binding I dare you to look and give this method a try! Bottle Cap Pin Cushion Ring - So handy for hand work! A 16.9-ounce Best Press bottle works; 2 bottles will be needed. Combine 2 cups water and 1 tsp. salt in a pot; bring to a boil. Combine 1 cup water and 3 heaping TBLS. flour in a jar or well sealed tupperware; shake to mix. When the water and salt boils, lower temperature to a gentle boil; add flour and water. Cook on medium heat until the mixture thickens like gravy. Stir it so it doesn't stick. Remove from heat. Let cool to room temperature. When mixture is cool, pour it into the spray bottle. Add 1 cup rubbing alcohol or vodka. Shake well to mix. Recipe revised, but courtesy of StringandStory blog. I was a June 2014 batt-girl for Quilter's Dream! Don't let the fear of the time it will take to accomplish something stand in your way of doing it. The time will pass anyway; we might just as well put that passing time to the best possible use. 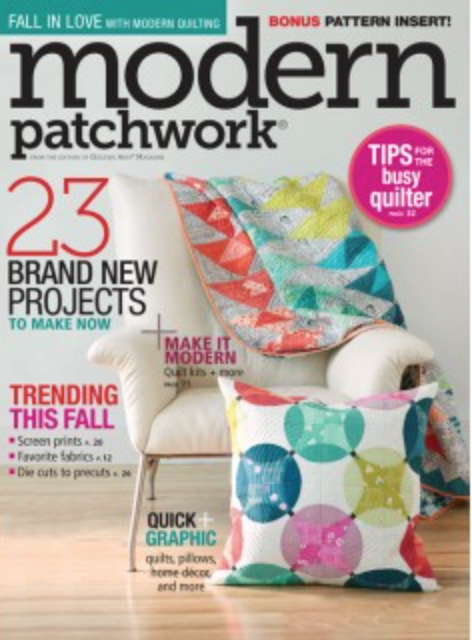 My Modern Hexagon pillow in "Modern Patchwork" magazine. 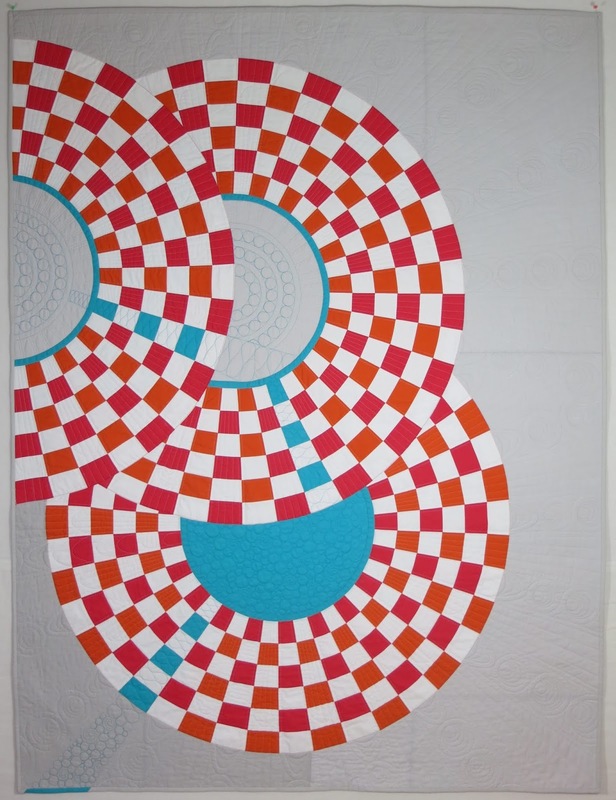 Inspire others to make quilts. Encourage others as they make quilts. What glorious gifts from God!